IRM|Pro™ enables healthcare organizations to efficiently identify exposures, manage and reduce the likelihood of a breach, save time and money, and meet HIPAA compliance requirements by identifying the unique threats and vulnerabilities applicable to their organizations. With today’s increasing threat landscape and OCR enforcement activity, healthcare providers, payors, and their business associates can no longer effectively manage cyber risk or meet HIPAA compliance requirements with “one size fits all” spreadsheets. Hundreds of healthcare organizations have adopted IRM|Pro™ software as their Enterprise Cyber Risk Management Software (ECRMS). Your organization’s needs are unique—so are the threats, vulnerabilities, and risks. Contact us today to find the right solution for your needs. A purpose-built, expert system that provides an enterprise view of your top exposures along with actionable insights to improve your security posture. Efficiently perform an enterprise-wide, NIST-based, OCR-Quality™ enterprise risk analysis across all ePHI assets and medical devices, evaluate vulnerabilities and threats, assess risk, and manage risk remediation. A comprehensive tool for performing a periodic Security Assessment, as required by the HIPAA Security Rule. Assess compliance with all standards and implementation specifications, identify gaps in your compliance program, and effectively manage remediation actions. 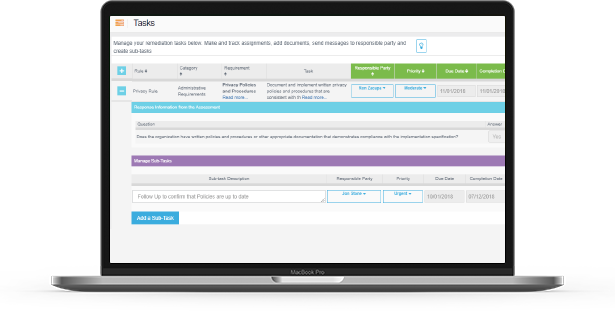 A comprehensive tool for managing compliance with the HIPAA Privacy and Breach Notification Rules. Perform an assessment of your organization’s compliance with these rules, identify gaps in your compliance program, and manage a plan to remediate gaps. Facilitates adoption of the National Institute of Standards and Technology (NIST) Cybersecurity Framework (CSF). Assess the current state of your organization’s adoption of NIST CSF, set your desired tier, and manage progress towards achieving your goals. 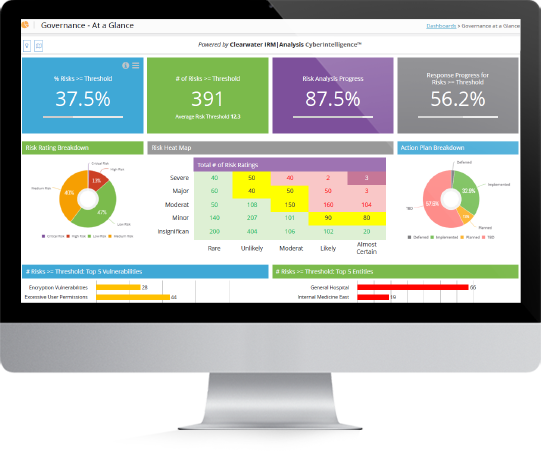 Gain actionable insight into the most critical vulnerabilities, control deficiencies and the remediation. 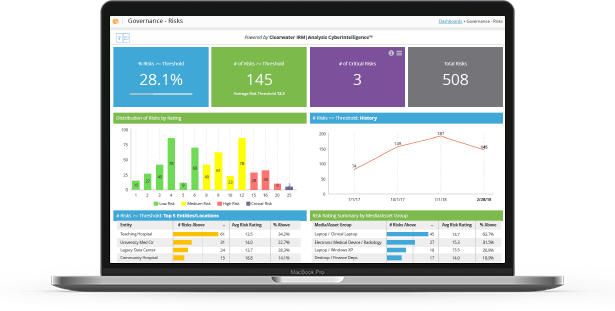 Get real-time updates on risk analysis progress, risks above threshold, control deficiencies, and risk mitigation status. Know where your organization's biggest exposures lie and where action can make the most meaningful impact. Assign tasks such as control evaluations and risk mitigation action items. Users can view and update work performed on their tasks and risk managers can monitor status, send reminders, and get up-to-date reports on progress. Clearwater’s IRM|Pro™ was the only user accessible software I found that operationalized the NIST framework through automation and made it manageable to apply across our assets. I could not find another vendor providing this type of software solution targeted at risk assessment automation. Are you confident in your Cyber Risk Management Program?